This vegetarian starter recipe is perfect for you pub business. Your pub will benefit from the delicious taste and the fast preparation thanks to the COLMAN'S Sage and Onion Stuffing Mix. For a different colour, replace the candy beetroot with red to give the appearance of sausage meat. Melt the MEADOWLAND Professional then add the vegetables. Cook for 5-6 min. allowing to soften. Bring the water to the boil then pour over the COLMAN’S Sage and Onion Stuffing Mix and stir. Add the vegetables to the stuffing and mix through. Pour the mixout on to a tray and allow to cool. Boil 10 eggs for 5 min. then drain and cool before peeling. Place the flour, breadcrumbs and remaining eggs into separate trays. Take some of the chilled vegetable mix and carefully wrap it around the boiled eggs. 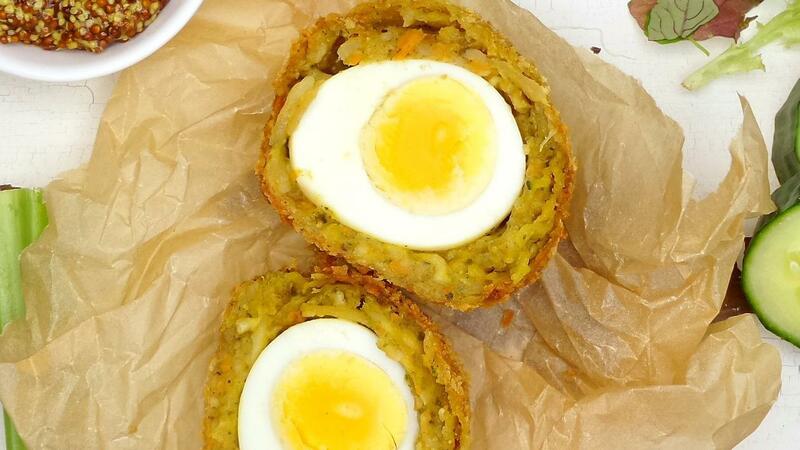 Pass the scotch eggs through the flour, egg and breadcrumb ensuring they are well covered. Cook the eggs for 6-7 min. in the deep fat fryer until golden. Remove and allow draining off any excess oil then allowing to cool before serving.